The company's decision to issue $1 billion in stock and convertible notes was not well received by the market, and it's also why management immediately reversed course. What: Shares of Weatherford International (NYSE:WFT) declined by more than 16% in the month of September, mostly on the announcement that it would raise $1 billion through stock issuance. The rapid decline in price following the announcement caused management to cancel the equity issuance in less than 48 hours. So What: Yes, pretty much the entire energy industry has suffered for more than a year, and this past month was particularly harsh, but Weatherford has been struck harder than many during this downturn as the company has tried to find its footing after several restructuring and moves by management that have raised a few eyebrows. This most recent episode of odd management moves came on Sept. 20 when the company announced that it was planning on issuing $1 billion in stock to use for acquisitions as well as general spending. This wasn't well received, as the company had basically spent the previous year and a half looking to shed itself of $3.5 billion in its own assets to shore up the balance sheet and become a more profitable company. By the end of the day on Sept. 21, management had decided to not go through with the equity issuance. The reasoning, according to Weatherford's statement, said it was "unwilling to sell securities at prices that do not reflect the value we have created at Weatherford." That may sound like a sound idea. But if that was truly the reasoning for not issuing shares, then why would management want to issue shares in the first place? 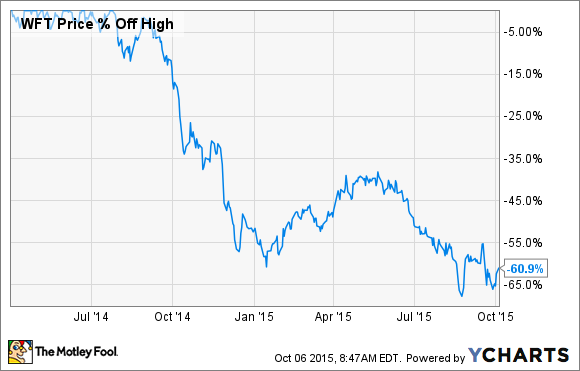 After all, Weatherford's stock has declined more than 60% from its high over the past 18 months. Now What: Weatherford International has been pulled in a lot of different directions over the past couple of years. But the overarching theme of the company's moves has been to reduce debt and increase profitability. According to management, it has cut more than $1.7 billion from its cost structure between 2014-2015, but it has still yet to turn those cost savings into per-share profits. Much of the company's earnings in the past two years has been eroded by the $1.9 billion in restructuring costs, asset writedowns, and goodwill impairments. Perhaps once the company finally resets itself and isn't carrying these large charges on the books it will generate some profits for the first time since 2011. As an investor, though, it's probably best to sit this turnaround out for a little while longer until all of this restructuring is resolved.